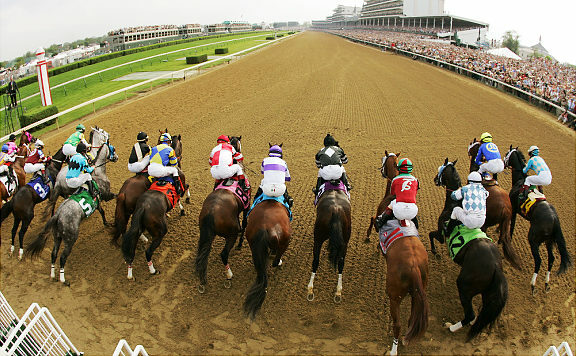 Saturday May 4th will be the 139th running of the Kentucky Derby at Churchill Downs. The "most famous two minutes in sport" unites classic fashion style, 19th century cocktails, gambling, and an age-old sport of kings in a quintessentially American event. The fellows suited up in seersucker, ladies in elegant straw hats, bourbon mint juleps in icy tins, and wagers on a long shot to win are a tradition. For loungers, it is a friggin' national holiday and expect us to be celebrating in full regalia, julep chalice in hand, at our favorite watering holes! This Derby Day we recommend the grand daddy of mint julep variations adapted by historian David Wondrich from a recipe in an 1857 edition of Harper's Weekly and trifecta of authentic Derby viewing parties in New York City for the win! Gently rub the mint leaves on the inside of the julep tin and discard. Add cognac, rye and rich simple and stir mixture gently. Fill cup with crushed ice and garnish with mint sprigs. Insert sterling silver straw in between mint sprigs. Julep master Maxwell Britten and his crew of dapper drink slingers will be throwing one hell of a pre-race BBQ in Maison Premiere's backyard. Icy platters of oysters will be plentiful and an extensive menu of mint juleps served in silver beaded tins will be available. The Maison Premiere House Band starts at 3pm and goes to 7pm. This year there will be a fashion contest for the most Derby outfit. Prizes range from booze (hurrah!) to $100 gift certificates! The Derby will also be broadcast live on the cocktail den’s famous old-fashioned radio from 6:28 to 6:30. Bulleit Bourbon will provide complementary passed hors d' oeuvres and mint juleps. Mixtresses Elayne Duke and Julie Reiner set up shop in the front of Clover Club with their julep bar again this year. They encourage guests to sport fancy hats, seersucker suits, and crank out juleps for all. Oh yeah, there will be a very short horse race shown;) Don't miss it! The gang at Rum House breaks out the julep cups, crushed ice, and copious amounts of mint and partner with Heaven Hill Distilleries' new Larceny Bourbon for $8 Julep and Old Fashioned drink specials. Come watch the race live on the big screen with Larceny bourbon cocktails. There will be food. There will be fancy hats. And there will be ponies. Our trifecta picks for the 139th Kentucky Derby are All Other Three Ye (5:1) to win, Verrazano (6:1) to place, and Goldencents (7:1) to show!